A little late again, forgive me. This week my favourite things are the curtains I mentioned in my Monthly Goals round up post. Here is a picture of them. Naturally trying to capture curtains in good light is always going to be problematic, but you get the gist. The two pieces of fabric were slightly different in shade but it's not as obvious as it seems here. I had them made fully lined and they are attached by rings, so they are dark and make a pleasing rattling sound when being opened or closed. 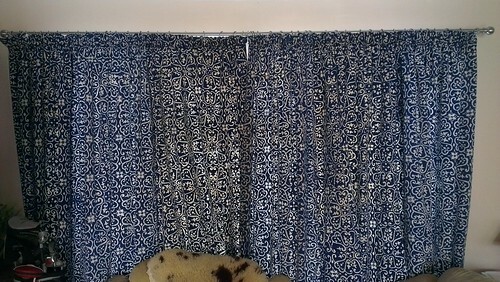 Mr Z and I have lived for years in twilight, because the £12 Ikea curtains didn't really require opening to let light in, and I was very resistant to net. However, now opening and closing them has become a daily pleasure. I got them made up by a local seamstress who looked at the fabric doubtfully but measured it up nonetheless and then said, when giving me the price (which was half the price of the smaller John Lewis curtains we had made for the bedroom nine years ago), "Well they'll last you forever, which is just as well, because nobody else would want them." Thanks! The fabric came all the way from Ceylon. Did I mention that? It has the odd stain which adds character, I feel, and can't be seen anyway due to the drape. Curtains. My favourite thing. I am definitely not in my 20s anymore, Toto.